Hello again and thanks for stopping by! Freshly back from recent travels I was looking for inspiration and found it on the Tastemade site. You know, it is that site you see posted and then re-posted on Facebook with the sped up videos enticing you to cook something that you never do. Yeah… that site! Well, when I saw their post for Grilled Chimichurri Chicken wings I knew I had to try that recipe for myself. I have cooked using Chimichurri sauce before but it was with steak not chicken. The flavors in this sauce are the perfect compliment to grilled chicken wings. Now sit back, grab an ice cold Cristal lager, and enjoy this post for Kamado Chimichurri Chicken Wings. There are so many variants on Chimichurri sauce. For this cook I stuck to the recipe featured on Tastemade. Olive oil, red wine vinegar, parsley, cilantro, jalapeno, garlic, and red pepper flakes did the trick! After you combine all the ingredients put some to the side for garnishing the wings when they are done. For this cook I used my Big Green Egg Mini Max preheating it to 350° using a platesetter for indirect heat. The wings went on for about an hour flipping them occasionally until they measured 165° using a instant read thermometer. After I pulled the wings from the grill I tossed them with the remaining Chimichurri sauce, fresh cilantro, and sliced jalapenos. This meal was fantastic! 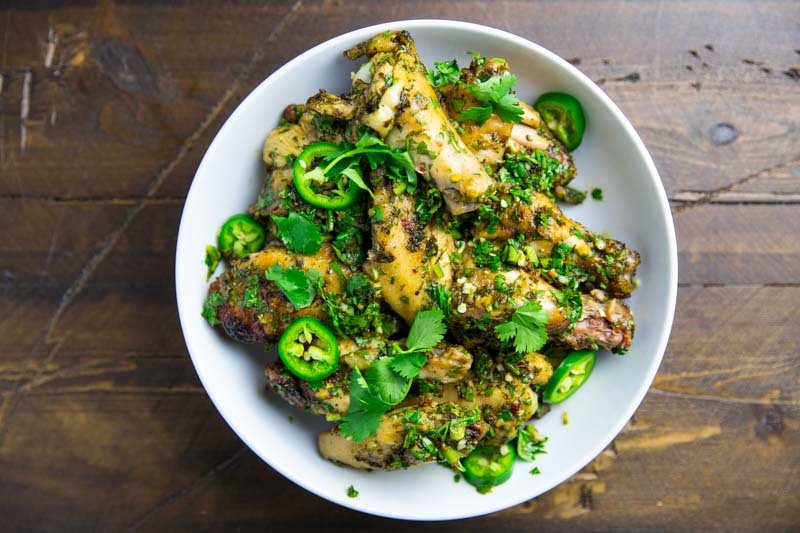 This recipe for kamado chimichurri chicken wings is another great recipe. Easy and packed with flavor this will be a huge hit at your next BBQ. In a large bowl, mix all ingredients, except the chicken, until well combined. Separate some of the chimichurri sauce for serving later. Rinse and dry the wings then add to the marinade. Cover and place in the fridge to marinate for 2-3 hours. Heat your Big Green Egg to 350° using a platesetter for indirect cooking. Add the wings and cook (turning every so often) for 45m to an hour. Garnish with more chimichurri sauce, cilantro, and jalapeño.